Skin repairs itself most effectively at night-time, which is why it is so important to have a nightly skincare routine if you want to tackle any skin concerns. 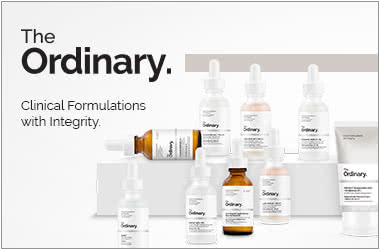 The Ordinary offers a large selection of high-potency treatments, serums, and oils that are best applied to skin before bed for maximum benefits. Why is an evening skincare routine important? Your skin works according to a natural body clock. Whilst your skin is focussed on protecting itself during the day, it is at night-time that your skin goes into repair mode. This is the best time to apply active ingredients, as your skin will make the best use of them during repair. An effective evening skincare routine lets you treat skincare concerns, such as dry skin, ageing, acne, pigmentation, and uneven skin tones, head-on. At night-time, you can also use a variety of powerful ingredients that should not be used in the day due to increased sun sensitivity. Which products are best used in the evening? Which products are best for oily and acne-prone skin in the evening? Oily skin can be prone to breakouts. In order to keep your skin clear, you need an effective skincare routine to prevent breakouts and manage oil levels. Start off by cleansing your skin. Then Granactive Retinoid 2% Emulsion. Retinoids should always be used at night-time, as they increase sun sensitivity. This emulsion helps to even out skin texture and minimise scarring and pigmentation from previous breakouts. On alternate nights to the Retinoid, use Salicylic Acid 2% Solution. Salicylic Acid exfoliates the inside walls of the pores to fight against blemishes and enhance skin’s clarity. Finish with Hyaluronic Acid 2% + B5. This lightweight hydrating serum is the perfect last step for oily skin. Which products are best for dry skin in the evening? Using intensely moisturising formulations at night is one of the best ways to hydrate dry skin. After cleansing, apply lightweight Hyaluronic Acid 2% + B5 for an instant moisture surge. Then use 100% Cold Pressed Moroccan Argan Oil to help soften and smooth a dry and flaky complexion. Finish with Natural Moisturising Factors + HA to immediately lock moisture in. Which products are best for ageing skin in the evening? Cell regeneration happens overnight, so it is vital that you tackle the signs of ageing skin overnight. You will wake up to a healthier and more youthful-looking complexion with little effort. After cleansing, apply Granactive Retinoid Emulsion 2%. This encourages skin-cell turnover and diminishes signs of ageing such as fine lines and wrinkles. Only use this high-potency serum every other night, as it can cause skin sensitivity with repeated use. Every night, apply the Buffet serum from The Ordinary. This is a water-based serum that tackles multiple signs of ageing at once with a powerful blend of Amino Acids, Hyaluronic Acids, and Peptides. Finish with Natural Moisturising Factors + HA to nourish dry, dehydrated, and ageing skin. Which products are best for sensitive skin in the evening? Those with sensitive skin will want to avoid very strong active ingredients in their evening routine, as they may cause further irritation. Instead, stick to gentle products that nourish and soothe the skin. After cleansing, we recommend Lactic Acid 10% + HA 2%. Whilst many exfoliators may cause sensitivity, Lactic Acid is known to lightly and gently exfoliate the skin for a brighter and smoother complexion without the irritation. This product also contains Tasmanian Pepperberry, which can help to reduce the inflammation and sensitivity often associated with exfoliation. Follow with Hyaluronic Acid 2% + B5 to deeply hydrate skin without causing irritation. This is a dream product for my dry, sensitive skin. I’ve seen a reduction in fine lines and early signs of ageing after a few weeks of use, and it hasn’t irritated my skin or broken me out and my skin has stayed lovely and hydrated.